Bogota gets me on a Sunday March silent and empty, far from that preconception I had of chaotic and noisy, as if the world had stopped in this other part of the ocean. Shortly after I find out that it is common for, weekends, its citizens migrate en masse to the outskirts of the city, and more reason if you also Monday is also holiday. A very common feature of these cities where many people live elsewhere. This allows me to take advantage of the early days of my stay and commit me to walk in their streets discovering stealthy large number and variety of restaurants, bars and terraces around me, with the continuing threat of overcast sky, thus beginning the relationship of curiosity and friendship that all visitors have when we face a new destination. Discover some very interesting initiatives, as in the case of Crepes and Waffles, as the locals say, where he emerged brunch. A concept born in 1980 when two young university opened a small creperie in Street 85, with the slogan “If you get to the heart, you stay in the mind”. Incorporate a high social component that has permeated in a very relevant way in the soul of society Bogota, since all their employees are single mothers with children who find themselves in this activity a way to go forward in an environment that does not get easy. Today is a big chain with many outlets throughout Colombia, as in most Latin American countries, even it has an own radio station. Also I have the opportunity to discover the character more caring and sustainable of the society through the absolute rejection of the use of straws, or as they call pitillos, drinking liquids. I am told, everything is born by the impact of a photograph of a turtle with this contraption on the nose that makes removing the consciousness of many city schools and are the children themselves who encourage non-use of these fags their parents in business gastronomy. I watch the huge transfer there in all restaurants, where some youths charged a giant bags on their backs and park their bikes at the door of business, do not stop getting in and out. I find that this is a service delivery digitized called Rappi which it allows you to order almost anything at home, in fact his slogan is: “Everything you want in your city, we take it to your house in minutes”, even they tell me they can take up money, by the huge degree of confidence that exists by customers in this service. This fictitious calm is very short and hours later, like a lion enraged, Imagined Bogotá wakes, with its traffic jams (jams), his incessant rain and accelerated bogotanos come from all corners of the country. 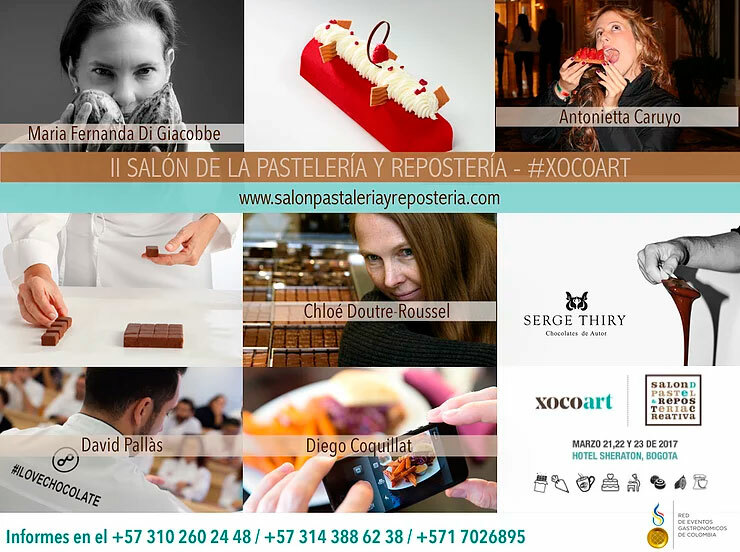 And thus begins the main reason that leads me to this city, XocoArt, Pastry Hall II and Pastry Chef held during the days 21, 22 Y 23 March at the Sheraton Hotel Street 26. In a packed room of attendees, We could find a mixture of cooks, confectioners, chefs, coffee and chocolate makers from different countries come. So that, between interesting talks on cocoa, the coffee, the benefits of chocolate and the art of pastry, impart my first conference in Colombia, explaining the process of digital transformation that is occurring in the global food industry, and how Spain is facing such change. A few days later also it imparts a workshop on the main techniques and tools to undertake this digital challenge in the food business. Colombia is a country with a high rate of digitization in population, most of its citizens, mainly in large cities like Bogota and Medellin, They have Internet access and a smartphone that allows them to share content across the major social networks we all know. But as in any process of digitalization at an embryonic stage, the industry is not responding to this digital communication and users promote, in the case of food and drinks in Colombia, he 90% contents related to the sector, only 10% from industry. this evidence a great opportunity by the latter to start a relationship that will enable digital counterpart to the existing demand. The sector still has not understood that have moved from a face only relationship, to another where is no longer important only the consumption stage, but it has been stretched and digitized, becoming a bidirectional pattern in which live naturally face elements with digital. A good example of this is the food delivery service provided by the different applications in Bogotá. Only a few large companies, mainly brewers, They are giving the necessary counterpart to a user that increasingly demands more attention for these new digital media. But an interesting ecosystem occurs, and is that Bogota is the city of delivery, is part of their culture the fact order delivery, where applications, such as commenting at the beginning of this article provide an optimal response to users. Restaurants understand that there is no limitation in the physical space of your service, but this is perfectly transferred to the homes of their customers through technology. This idea of ​​food at home is much more developed digitally in Colombia than in European countries like Spain, which is difficult to understand the context no longer puts the restaurant but the customer has enough technology to choose where and when you want to live your dining experience. While I recognize that favors much these services, the chaos of traffic in some cities, well represented by Bogotá. The cuisine is breathed in the streets of this city, there is a global turmoil on all issues related to food, and so I personally manifests Maria Claudia Laocuture, Minister of Commerce, Industry and Tourism of Colombia. further, at the opening ceremony of XocoArt he cited his government's commitment to the promotion of tourism, as the second generator of foreign exchange after oil, and within this, the importance of gastronomy whose main attractive dynamic of this activity. Colombia is in a constant search for its gastronomic DNA, finding in the traditions and legendary recipes, the essence of its magic spots, and the unique quality of its products. These elements have enough baggage to differentiate themselves from their neighbors and help them find the authenticity and richness of its gastronomy to show the world. I was lucky enough to make a gastronomic tour of Colombia thanks to two of the best chefs in the country, Leo Espinosa Y Diana García probably sooner rather than later they will be candidates to get the first star Michelin for Colombia, something very necessary and that would certainly put on the international gastronomic map to this country. As I mentioned in the post that you post on my Facebook profile and share here, “traveling across a country through gastronomy is one of the most amazing experiences you can have”. I do not want to end this article without thanking Luisa F. Galician, director of the lounge and all his incredible team passion, effort and talent put into the realization of an event that seeks promote training and innovation in gastronomy and that have made us feel all participants clothed and at home even though some were crossing an ocean. Although I can not stop confessing my enormous admiration for the towns and cities of Latin America, for its people, for sympathy, for her culture, for its folklore, for its gastronomy. Why on every trip I make to those lands I find so many things that unite us with Spain, which always makes me come back with nostalgia syndrome traveler who thinks he will soon return. 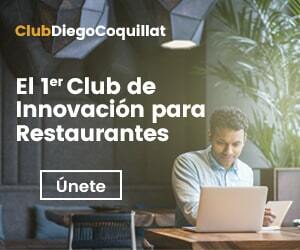 Good to have you in our country Diego, Some years ago I receive your newsletter and I love the content that you mention, really helpful for development and projects that call on entrepreneurship in Colombia, Unfortunately I could not attend this wonderful event. I think there is a big opportunity for digital level for social media restauranting in the country and certainly need to enhance the Colombian cuisine, to tell the world that here you eat delicious! Welcome always DIego, greetings from Bogota.